Opening times Mon–Sat noon–1am; Sun 12.30pm–1am. Seasonal times Festival: open 11am–3am. Food served Mon–Sat noon–midnight; Sun 12.30–10pm. Pre-theatre times Monday – Thursday noon–4pm. As well as serving their own experimental beer range, Edinburgh’s BrewDog have sniffed out some of world’s most interesting brews. 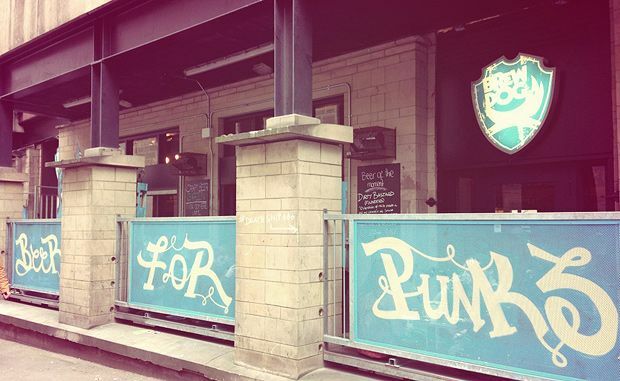 Opening their second bar in the big, bad capital back in 2011 was a big step in BrewDog’s beginnings. Now, with over 40 bars worldwide and more in the pipeline, the Auld Reekie branch is doing its best to showcase the expanding range. BrewDog memorabilia is scattered around the room to tempt an ever-growing fan base, but the exposed brick, wood and swanky window-style mirrors demonstrate their tasteful style. Draught beers are listed on retro readograph signs above the bar, beside the list of guest beers, allowing you to weigh up your options. Whether you go for a flagship Punk IPA, an amplified Cocoa Psycho, or Oskar Blues’ Death by Coconut, the self-proclaimed beer geeks behind the bar will select the appropriate glass to optimise taste. Food wise, options are fairly limited, but their handmade, crispy-based pizzas and richly flavoured ale pies are yet another example of their focus on quality over quantity. Notable dish: Hamish McHaggis Pizza with normal or veggie haggis, red onion and blue cheese.